The first set of pictures following appear here by courtesy of Koji Yuen of Okayama, Japan and Peter Barney, who also supplied the captions. 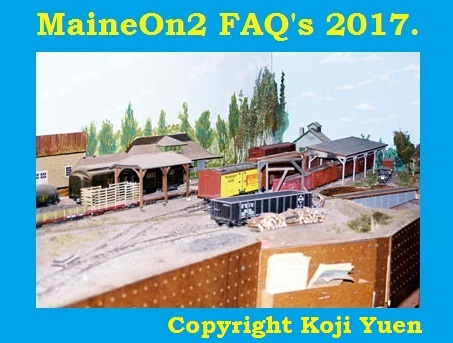 They were taken by Koji when Peter’s home layout featured in the Layout Tours of the 22nd National Narrow Gauge Convention of Warwick, RI in 2002. Peter’s On2 layout almost fills the basement of his home in southern Massachusetts. The line is a point to point reproduction of the SR&RL from Farmington to Phillips, Strong and Rangeley. The line is wrapped around and threaded through the walls in the basement which support the house above, presenting the line as a series of vignettes and operating areas, and not offering any one viewpoint which shows the complete extent of the line. 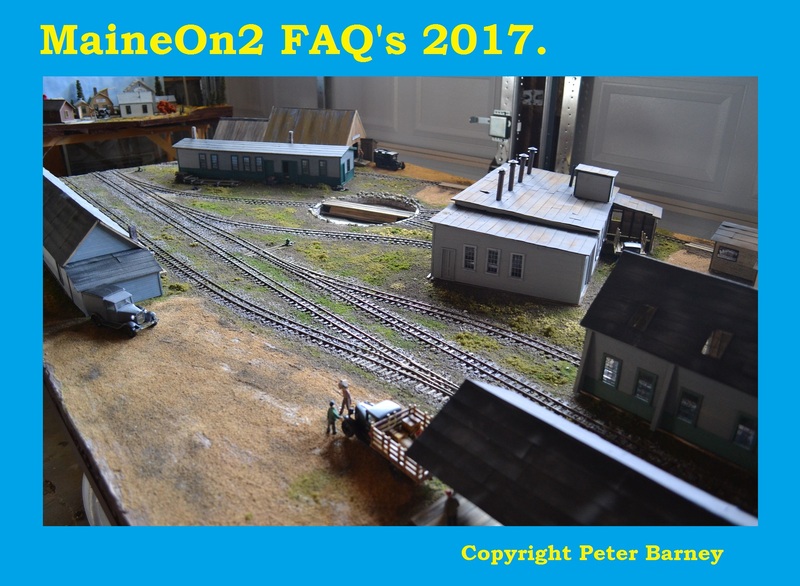 Peter advises that much of the line, except the Farmington area has been rebuilt since these pictures were taken, and an example is shown at the end of the 2002 pictures. The author’s own recollection of his visit to the line (in the late 1980’s) is that many of the mills were built large enough to correctly dwarf the trains. Farmington yard. While shorter than the original does have the feel and the standard gauge lines crossing two foot gauge lines. Looking north toward Phillips. The model yard was a mirror image of the real Phillips yard. Phillips yard; the roundhouse had three full stalls, then 7 fake stalls against the wall. # 18 switching Phillips yard. The International Mill in Phillips made from plastic engine house walls. Freight train going through Dead River. 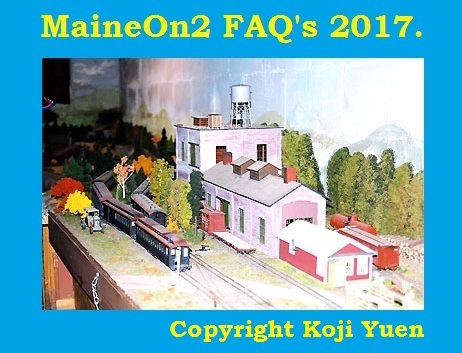 Peter’s modeling was not limited to the SR&RL in On2, but extended to the other Maine Two Footers being given running rights over the SR&RL layout; the basement also housed Peter’s Kennebec Central layout which was featured in Railroad Model Craftsman. The picture below shows the Sandy River being invaded from trains from Fiji. Peter made the locomotives from Mantua/Tyco 0-6-0 mechanisms narrowed to On2. …………..Sweet! Like many On2 modelers, Peter also models in the large scales in his garden. 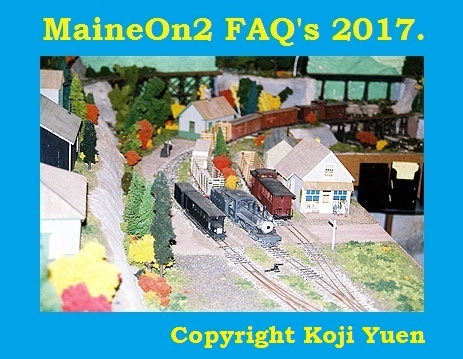 To visit Koji Yuen’s website showing his railroad models click here. An English language page is available. Some more of Peter Barney’s modeling. 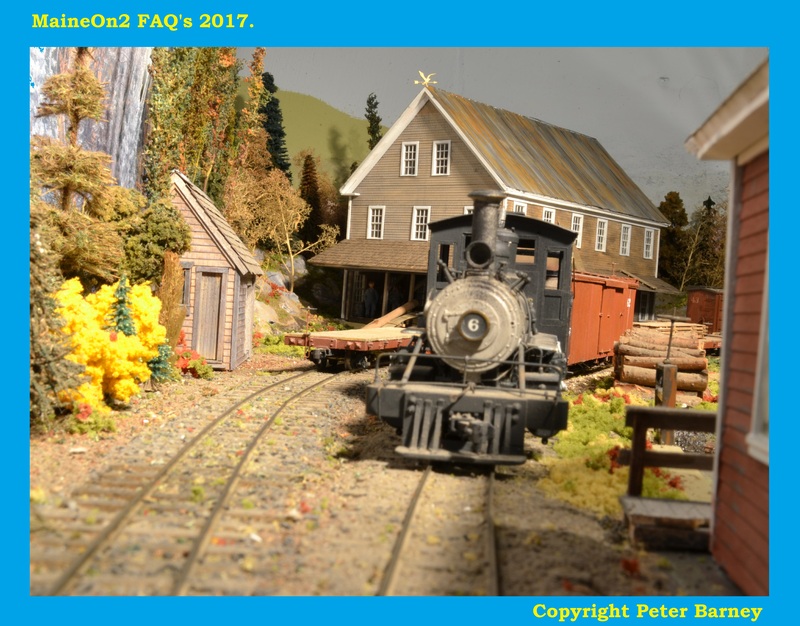 This picture shows the latest section of the layout that Peter has re-built – the Clary Mill with Wiscasset #6. Click on the picture to view at a larger scale. 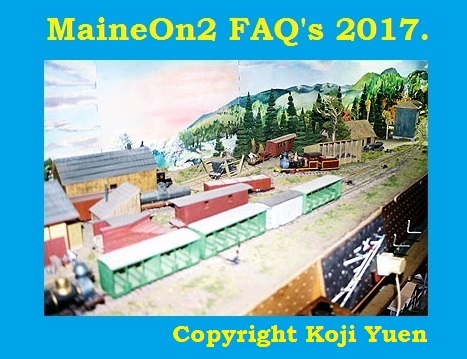 Peter built this module of Bridgton for the Bridgton Historical Society, where it is now on display. 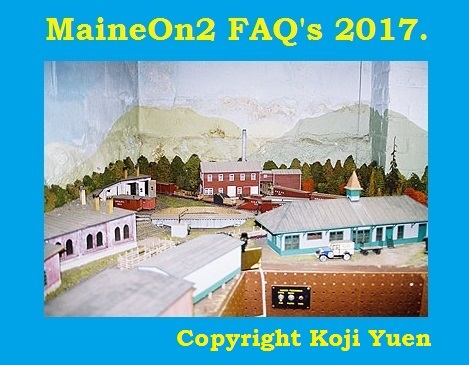 In 2015, the WW&FR Museum of Alna, Maine commissioned Peter to build this module to show visitors what the Wiscasset water front looked like when the line ran down that far in the 1900’s. This entry was posted in Koji Yuen, Layouts, Peter Barney by terry2foot. Bookmark the permalink.